The Latin name of this plant, Rosmarinus officinalis, means dew-of-the-sea, probably because rosemary generally grows well by the seashore. Rosemary was used as incense by the ancient Romans and according to legend, Mary sheltered the baby Jesus under a rosemary bush. Rosemary was used in Roman burial rites, and that practice continued well into the middle ages when it was customary to lay branches of rosemary on the coffin at funerals. 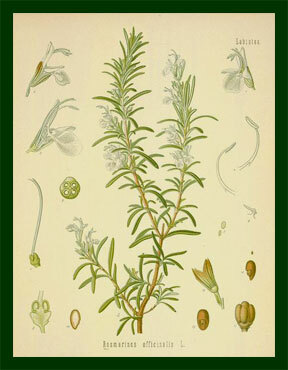 It was believed quite wrongly that oil of rosemary could be used to treat patients infected with plague. 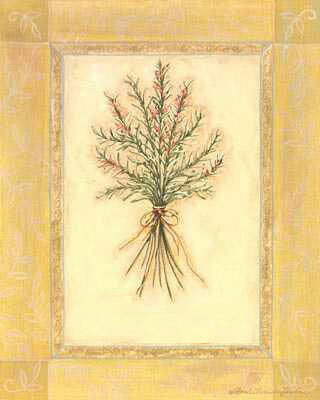 A sprig of rosemary placed in a buttonhole is said to bring good luck and improve memory. One of the loveliest of all herbal legends is the story of why rosemary has blue flowers. When the holy family fled into Egypt, a weary Mary spread her cloak on a white flowered rosemary. The flowers miraculously changed to the blue of Marys cloak. The Spanish name for rosemary is romero, or pilgrims plant, and derives from this legend. For botanical accuracy there is a species with white flowers, but the rest bloom in shades of blue. Another legend states that rosemary will never grow taller than a person, nor exceed Christs age at death. Integral to Biblical and medieval gardens, rosemary is also found in Shakespearean gardens, for the various references to rosemary in his plays such as this line from Hamlet, "Theres rosemary; thats for remembrance." Rosemary, Rose of the Sea, Dew-of-the-Sea and Rose of Mary, is not mentioned specifically in the Bible but is a plant of ancient lineage and extensive coastlands. Beginning with Dioscorides, the first century doctor to the Roman Legion who wrote of rosemary and its virtues in Materia Medica, a list of 400 healing plants, rosemary has been written about more than any other herb. Household (1) Place a fresh bough in a room to cool the air. (2) Boil a handful of rosemary in two cups of water for 10 minutes to yield an antiseptic solution for washing bathroom and kitchen. Decorative The rosemary branch provides a fragrant skeleton when woven into wreaths and garlands. Practical When stripped of leaves, rosemary stems can be burned on a fire or barbecue for a lovely aroma. Medicinal Stimulates circulation and eases pain by increasing blood supply where applied. Aids fat digestion. Good for aching joints and rheumatic pains. Use as an antiseptic gargle and mouthwash. Ideal for exhaustion, weakness and depression, the aerial parts invigorate the circulation, stimulate digestion, and are good treatment for cold symptoms including chills and rheumatism. They are useful for headaches that are eased by warm towels rather than ice packs. Harvest fresh, year round, and take either as an infusion or tincture. Rosemary is used to treat joint pain, sore muscles, and minor digestive problems such as loss of appetite, mild nausea and gas. These leaves contain a variety of substances that are antibacterial, stimulate the flow of digestive juices, and relax the intestinal tract. To take internally, drink as tea or as a tincture. To apply a compress, soak a pad in the hot infusion of rosemary leaves; this can be used for sprains. When applied to the skin, rosemary oil made improves blood flow to the area. For digestive problems, steep one teaspoon of dried leaves in one cup of boiling water for ten minutes. Drink one cup before meals, up to 3 times daily. For sore joints or muscles, rub a few drops of the essential oil or a cream standardized to contain 6 to 10 percent essential oil into the area up to four times daily. One half teaspoon 3 times daily before meals, or as directed on the package. One teaspoon up to 3 times daily before meals, or as directed on the package. Comments and cautions: DO NOT USE rosemary oil internally. Rosemary leaves may cause diarrhea in children. Moderate dietary use is safe; external use of oil may cause skin irritation. Before starting preparation, bring a large pot of liberally salted water to a boil for the pasta, and begin cooking, stirring often. Allow the pasta to cook until softer than al dente but not falling apart. Drain, reserving two cups of pasta water. While pasta cooks, drain and rinse beans. Crush garlic and finely chop rosemary needles. Heat oil in a large skillet over low heat. Add garlic, rosemary, and pepper flakes; cook until garlic is just golden, about one to two minutes. Add beans; increase heat to medium-low, and stir in half a cup of pasta water; season with salt and pepper. Simmer for 5 to 8 minutes, stirring occasionally and crushing about half of the beans with back of wooden spoon. Return pasta and remaining one and half cups of pasta water to their large pot and add the bean mixture. Bring to a boil, remove from heat, cover and let sit for five minutes. Serve with a drizzle of olive oil. Much love and blessings, enjoy!